​"And when these things begin to come to pass, then look up, and lift up your heads; for your redemption draweth nigh." Christ the LORD is the solution for our troubles. Turn to Him in repentance. 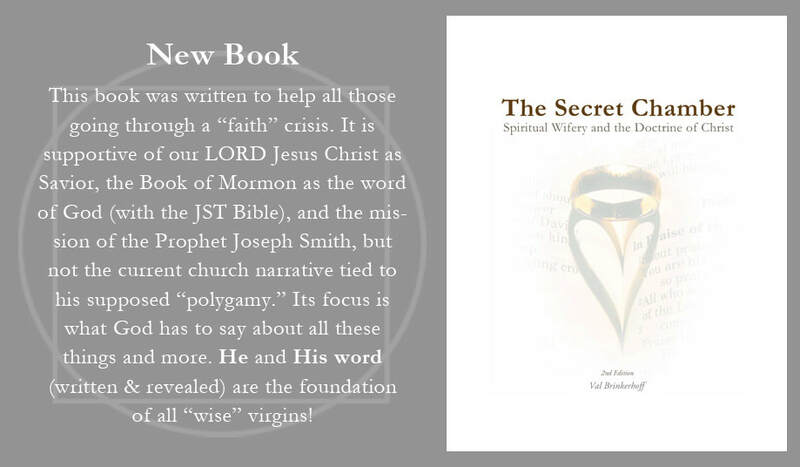 The new book below, The Secret Chamber: Spiritual Wifery and the Doctrine of Christ (second edition), addresses why there is a "faith crisis" today in the LDS church. It is a lack of Faith in Jesus Christ, our Savior and knowledge of how to be "redeemed." Our LORD has been replaced with idolatry, in looking to men for light. His word in scripture and pure revelation are our rock and sure foundation providing light and truth, not the words of men, including mine. God loves us and desires that we develop a fruitful "relationship" with Him. The corrupted institutions of men pollute His pure doctrine for "the sake of gain" (see 1 Nephi 22:23). It is in this same chapter of 1st Nephi that we read 7 times that He - as "the Lamb of God" - is THE PROPHET we are to follow! Turn to Him in humility and repentance and you will be blessed and enlightened. He is the gate to salvation and he employs no servant there. Holy unto the Lord: The Nazarite Vow and the Atonement / 111 pages / Many important figures in the Bible were “Nazarites.” The Nazarite vow is found in Numbers 6. It is a special way for men and women (anciently and today) to make personal covenants with the Lord, and with an expectation of miraculous results following its completion. This special “vow” has ties to the Atonement of Jesus Christ, one of ten blood sacrifices in scripture, each culminating in our Savior’s great sacrifice in Gethsemane, the scourging, and the cross. ​Lost Wisdom: Archetypes of the Atonement, Ascension & At-one-ment / 250 pages / This book returns much “Lost Wisdom” related to our return to God in this life (ascension), doing so via an in-depth discussion of three related concepts illustrated in the Three Facsimiles of the Book of Abraham; (1) the Atonement which makes our return to God possible (chapter 1, Facsimile 1); (2) Ascension into the presence of God (chapter 2, Facsimile 2); and (3) At-one-ment – becoming one with God (chapter 3, Facsimile 3). This discussion unfolds via important visual archetypes tied to each of them, as well as the ascension experiences of ten individuals, including Jesus Christ, Enoch, Isaiah and Moses, as well as that of Joseph Smith and Iohani Wulfgram. The combination of text, illustrations, and in-depth endnotes returns much of this lost wisdom. ​The Day Star: Reading Sacred Architecture / Two volume set, 400 pages each / In these two volumes the visual symbolism of the gospel of Jesus Christ is explored upon sacred architecture the world over, and especially that of latter-day Temples. It is an encyclopedia of discovery, with discussions of sacred space, sacred time, and everything from the meaning of the beehive, the pentagram, and the Seal of King Melchizedek, to Freemasonry versus Mormonism, and the rise, fall and resurrection of LDS temple symbolism. The connection of these visual archetypes to various important doctrines, including Calling and Election, the Second Comforter, and more are addressed. This book is available only at Amazon.com ($11.95, 286 pages, 8.5x11"). ​In 1831 the LORD prophesied that a secret combination would rise up among the Saints. He called it “the secret chamber” (D&C 38:13 & 28). Its focus was spiritual wifery. It has led to the awful situation among the Latter-day Saints today, one described two times in the Book of Mormon (Mosiah 2:36-41; Ether 8:24). Besides addressing this darkness in D&C 38, God also provided a way to uncover it there. He called it an “endowment of power from on high,” one poured out upon the humble, prepared Saints at the dedication of the House of the LORD at Kirtland in 1836. It was the Holy Ghost, or having access to the unified mind of the Father and the Son (Lecture on Faith 5 ). Many of those with this important gift chose to not follow Brigham Young west. They included the remaining members of the Smith family. The reason was polygamy and the control and fear tied to “the new order of things” Brigham Young was putting in place. This book addresses how polygamy rose up among the Brighamite Saints of Utah, and how it led to suppression of the fuller portion of “the doctrine of Christ” in Mormonism. Because of the early focus on polygamy, too few Latter-day Saints make Christ the LORD their focus, instead inserting the church and its leaders as substitutes for Him. It has resulted in idolatry, ignorance of how to be saved, and widespread deception. One of the most significant lies is that the Prophet Joseph Smith practiced polygamy, instituting it among the Saints. It is a lie, put forth by Brigham Young and those following him, all to justify their practice of it early on. Many are leaving the church today because of this lie and other deceptions, all a part of a false history and narrative, which the Saints have been fed. Some of this is simply ignorance. Some of it reflects greater darkness. The result, however, is many problems among us as a people. It need not be so. Seeing our awful situation today, Moroni saw that we would be surrounded by secret combinations that control us, keeping us in ignorance and deception for the sake of “gain” (Ether 8:24). They control our government, corporations, schools, and churches. This control has led to a second “awful situation,” the one described by King Benjamin. He wisely brought his people out from under the lies, deception, and control of “false Christs,” “false prophets,” and “false preachers and teachers” (Words of Mormon 1:15). They used the people for gain (1 Ne. 22:23). ​The “awful situation” among King Benjamin’s people was remaining in sin and ignorance without redemption (Mosiah 2:36-41). This is exactly where too many Latter-day Saints find themselves today. Many believe they are “saved” because of their works and our temples, when they are not. Few know what redemption is, or how to obtain it. Thus, many are unprepared for the great last-days harvest of souls that is nearly upon us (D&C 45:2, 56:16; Jer. 17:11). The Prophet Joseph taught that we cannot be saved in ignorance (D&C 131:6). We must “awake” from our slumber, our “awful situation” and “arise,” that we might go forth to meet the Bridegroom.” He Christ the LORD. He is coming soon. The Remnant Awakens / 250 pages, 4th edition / The Book of Mormon is written to the Lamanites, along with Jews and Gentiles. The Lamanites are called a “natural branch” and “my people” by the Lord in the Book of Mormon. They are the remnant of Jacob, Joseph, and Lehi on this covenant land, a land God promised to Lehi and his posterity as an eternal inheritance. If the “children” of this remnant “are to turn their hearts to the fathers” they must understand the promises God made to the fathers, as they extend to them as their posterity. The promises reveal that the remnant will soon rise up to become a light to whole house of Jacob in the last-days, when they are bowed down under sin. To prepare them for this and other important last-days roles, the Lord has visited the remnant here from time to time. One of the most widely reported visits was in 1890, Few today are aware of its far-reaching effects. There have been many others. This book addresses them in connection with the mostly unknown future role of the remnant and their leader among the Gentiles of this land. Seven Heavenly Witnesses of the Coming of Jesus Christ / 308 pages / What are the heavenly signs of our Lord’s Second Coming? What were the heavenly signs marking His birth and His later crucifixion? What events were tied to the blood-moons of 2014-15? How do we read the heavens today to understand what the Lord may be trying to communicate to us? The answers lie above us - in the heavens God created. They are signs and witnesses for us. Man cannot change them. They provide light and truth for what has been and what is coming, but only if we learn how to read their important messages. The heavens mark the timing of major events in the Lord’s redeeming mission to save us, past and future. As signs, they often fall on select Hebrew Holy Days, revealing relevant messages for us. There are twelve of these Holy Days; three types of Sabbaths, seven annual Holy Days, and two New Year’s Days. This volume helps us understand the Lord’s calendar, marked in the heavens above and by the Holy Days they fall on to get our attention. Our Lord uses conjunctions, eclipses, comets, and more in association with the Holy Days - to prepare us for what lies ahead. Additional highlights of the book include important new insights on the Lord’s Atonement in chapter 7 and how sacred architecture also serves as a witness for the Lord’s return in one of the Appendices. The Original Setting of the Temple & the Atonement / 160 pages / This book features seven archetypes found in scripture revealing the correct, original setting for the Jerusalem Temples. They point to an ancient location apart from current tradition on “the Temple Mount,” where the Islamic Dome of the Rock now stands, and where the ancient Roman Temple of Mars (god of war) stood before it. A more correct location chosen of the Lord and one meeting the requirements of the Law He gave His prophets - is 600 feet south of the southern wall surrounding what is called “the Temple Mount,” directly above the Gihon Spring, the only source of living water for some five miles in Jerusalem. Living water is a female archetype #1 in chapter one, a necessity for the rites of the temple. It is where priests were washed before and after their temple service, where Israel’s Davidic kings were washed prior to their enthronement, and where blood from sacrificed animals was washed away from the temple’s altar, etc. Consuming fire (coming down from heaven to consume the sacrifice at the dedication of temples) is archetype #2 in chapter two, a male symbol. Additional temple archetypes and their chapters follow, culminating in the Red Heifer sacrifice, occurring at the very setting where Christ fulfilled the ancient sacrifice rituals in the Atonement. These seven temple archetypes collectively reveal the location chosen by God for the Jerusalem temples and most importantly why – each of them pointing to the Lord’s eternal sacrifice completed in Gethsemane, at the scourging, and upon the cross. Pillars of the Priesthood: Teachings and Symbols of God’s Holy Order / 310 pages / The Holy Order has within it the Aaronic, Melchizedek, and Patriarchal “orders.” What is the difference between authority and power in the priesthood? How does God transfer His power to chosen sent servants? What are the roles of the Matriarch versus the Patriarch in the Holy Order? What is the sealing power, and how do we know when it is used in scripture? What is involved in priesthood cursing and the law of adoption? 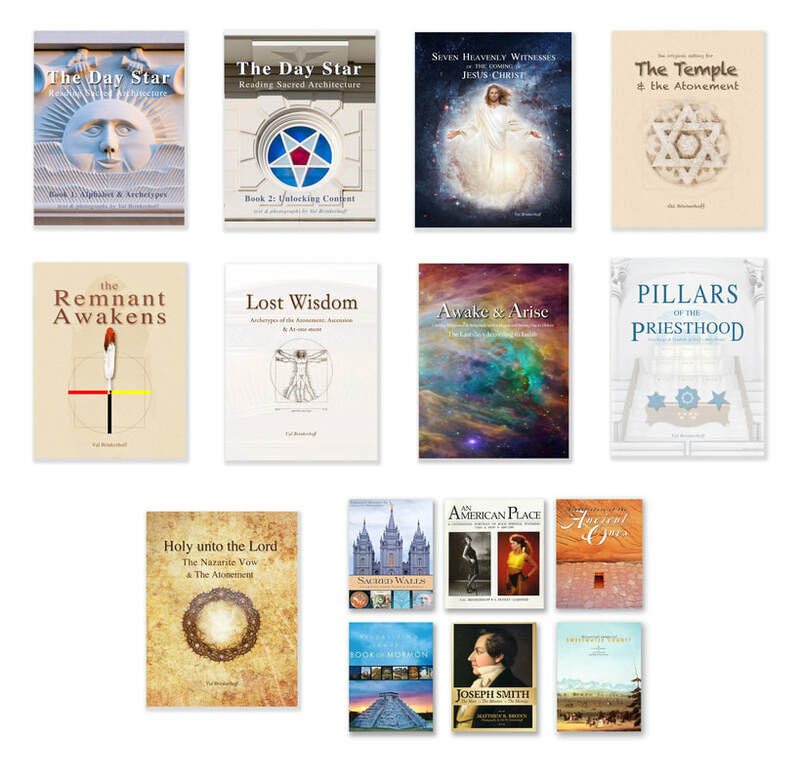 These concepts, their related visual symbols, and more are addressed in this unique book.